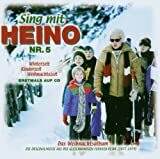 Heino (born 13 December 1938 as Heinz Georg Kramm) is a German singer of popular music (Schlager) and traditional Volksmusik. Having sold a total of over 50 million records, he is one of the most successful German musicians of all time. Heino is known for his baritone voice and trademark combination of light blond hair and dark sunglasses (which he wears due to exophthalmos). He lives in the town of Bad Münstereifel, where he owned a cafe until June 2012. His interest in music started when his mother gave him an accordion in 1948, although his family could barely afford it.